The success of tissue engineering and new research approaches open up unimagined possibilities for tissue medicine. Much of what appeared experimental years ago is now being used in medical applications. Tissue donation, tissue processing and transplantation will change in the coming years. There is still a long way to go before doctors can transplant laboratory grown organs and tissues. Therefore, for now, it is important to keep classic tissue transplantation going to meet the highly important needs of sick people. However, this network feels that parallel to meeting those needs, it is also important to research into the development of new processes and surgical techniques. Whether corneas, heart valves, blood vessels or bone implants, the trend towards the improvement of tissue transplants is irreversible. The corneal surgery is developing more towards lamellar surgical techniques. Now doctors replace only one layer of a diseased cornea. Since 2015, we have had permission to use previously prepared corneal lamellar for DMEK dispensation. Unexpected possibilities of the application of the amniotic membrane opens up new possibilities for therapies. Currently, we are researching a seamless use of the amnion in the eye. The preliminary studies are promising. Once the safety examination of three transplant centers has been completed, we are facing a breakthrough in the treatment of corneal diseases of the eye. Decellularization is the keyword in the processing and transplantation of heart valves. We are partners of an EU-funded study on the lifelong durable heart valve – ESPOIR – Clinical Study for the Application of Regenerative Heart Valves. There are many indications that decellularized heart valves last longer than former heart valves and even grow in children. Numerous other projects and studies are in progress. Once the results are available, we will inform you on them as well. Our GMP facility in Hanover offers ideal conditions for research and development. By networking with researchers, developers and users, numerous remarkable opportunities arise which can be implemented in the following projects. The DGFG is a partner of the European study ESPOIR for life long, durable heart valves. The aim is to change a donor valve and then to transplant it in a way where it is not rejected, will last a lifetime and even grows in children. The cells are removed from the heart valve by a complicated process. Afterwards only a framework of collagen remains. This decellularized scaffold is rebuilt by endogenous cells of the recipient. There are many indications that these heart valves last much longer than conventional heart valves. Ophthalmologists often treat corneal diseases or injuries with amnion transplantation. This comes from the maternal placental membrane which has excellent anti-inflammatory and wound-healing properties. Previously ophthalmologists would graft tissue by stitching a patient’s eye. This causes more damage to an already damaged cornea. Project AmnioClip worked with an interdisciplinary team to develop a clip ring, similar to a contact lens. The amniotic membrane is clamped in the retaining ring and seamlessly placed on the eye to be treated. The planned date of completion is 2016/2017. Lamellar corneal transplants are interventions for the eye, where doctors transplant only thin layers of the cornea. Ophthalmologists normally prepare these thin layers directly for transplantation in the operating room. The risk of accidents with the transplants is very high here. In Germany, the DGFG has developed a unique method to produce these thin layers for DMEK directly in the eye bank. The approval by the Paul-Ehrlich-Institut for placing it on the market has been in place since December 2015. This has reduced the labor and time of ophthalmologists in operating rooms. At the same time it ensures that the cornea transplantation will actually take place. Currently, a study is investigating the use of a newly developed transport cartridge for the optimal insertion of the lamella into the patients eye. The DGFG is project partner of the European Collaborative Project Euro-GTP II. It is about more safety and quality in tissue transplantation. Euro-GTP II will give continuity to the first Euro-GTP project, which has developed European Good Tissue Practices for the activities carried out in tissue establishments (TE). Funding is carried out over a period of three years in the Horizon 2020 health program. The DGFG is working together with tissue banks from Spain, Italy, Croatia, the UK, Poland, the Netherlands, Belgium, Bulgaria, Hungary and Finland. The project partners are working within the framework of EuroGTP II „Good practices“ for cell and tissue processing and patient follow-up. The partners of EuroGTP II want to achieve more safety and efficiency in the use of established therapies for all tissue processing and transplant facilities. 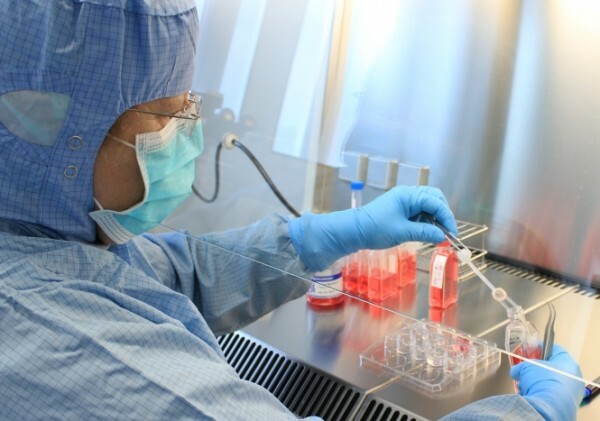 The outputs of the Euro-GTP II project will provide tools for assessing and verifying quality, promoting safety and assure efficacy of therapies with human tissues, Hematopoietic Stem Cells (HSC) and Assisted Reproductive Technologies (ART).